Tag line: "Edgar Allan Poe's dramatic story of the horrors of Paris"
An early entry in Universal's pantheon of horror, Murders in the Rue Morgue may not be as strong a film as the studio's more recognized classics, but it has its charms. Paris, 1845. Pierre Dupin (Leon Ames) visits the circus with his girlfriend, Camille (Sidney Fox). One particular sideshow attraction features a bizarre scientist named Dr Mirakle (Bela Lugosi) and his sidekick, a full-grown gorilla named Erik, whom the good doctor insists is an ancestor of man. In an effort to prove this theory, Mirakle has been secretly abducting women and injecting them with gorilla's blood, all in the hopes of finding the perfect 'mate' for Erik. Thus far, his experiments have ended in disaster, but when Camille catches Erik's eye during the show, Mirakle sets in motion a plan to make her the subject of his next round of experiments. Lugosi looks downright creepy as Dr. Mirakle, the scientist determined to prove man is descended from monkeys (a belief very few were willing to accept in the 1930's). With his patented stare and menacing smile, as well as a uni-brow that can't help but draw your attention, the actor brings just the right amount of madness to this particular mad scientist. Even more striking is the cinematography of Karl Freund, whose camera fully explores the shadowy set pieces that stand in for the streets of Paris, where, arguably, the film's best scenes take place. Along with an earlier sequence, in which Mirakle 'rescues' a street walker (Arlene Francis) who's just witnessed a knife fight, there's the thrilling climactic chase along the rooftops of Paris, where Erik is carrying a dazed Camille and attempting to escape from both Pierre and the entire Parisian police force, all of whom are in hot pursuit. Murders in the Rue Morgue does have its flaws, most notably the constant shifting between an actual chimpanzee (for close-ups) and a man in an ape suit (when shown at a distance) for the character of Erik. The filmmakers do their best to join these two 'performances' together, but in the end, it's an unnecessary distraction (and with Charles Gemora, who had donned ape suits in a variety of movies, playing Erik, one wonders why they bothered with a real chimp at all). The movie also drags in a number of spots, something you wouldn't expect from a motion picture that's just barely an hour long. 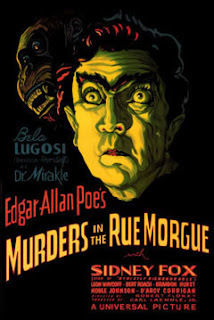 But with Bela Lugosi playing a mad scientist, and some chilling moments on the foggy streets of Paris, Murders in the Rue Morgue is definitely worth checking out.